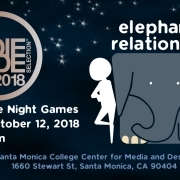 This weekend I’ll be part of a team presenting a discussion, Transmedia Play Experiments, at the NAMLE (National Association for Media Literacy Education) Conference in Torrance, California. The co-presenters are Meryl Alper and (in absentia) Becky Herr-Stephenson. We’ll be discussing our work on the Flotsam Transmedia Play project, which I worked on in 2012 and early 2013. The project uses Flotsam, the Caldecott Award-winning picture book by David Weisner, as a mothership off of which various educational transmedia experiences can be explored. Each piece of the overall Flotsam experience can be approached and played with independently, but certain elements of each can cross over and influence other aspects in other media. As an example, I worked with Flourish Klink on an educational collectible card game. Each card has a bit of educational trivia on it about the oceans and ecology, but when pulled together in a pack, they can be used to play a game with friends that mirrors the experience of traveling through the oceans like a piece of Flotsam. When combined with the dynamic e-book on an iPad, certain cards will unlock Augmented Reality elements, that cannot be interacted with through any other means. I’ll hopefully be able to log more about this experience after the conference.